Hx19 is a high speed, RFID tracking system using ultrasound to both isolate the RFID and determine its position to within a few millimeters. The hx19 is well suited for 3d indoor positioning and navigation. It is a system of mobile position transmitter and position receivers, and will operate entirely wireless with long life batteries. The hx19 serves small operations such as biomechanics, immersive VR and 3d animation, yet it is so expandable that it can guide robots and machines on factory premises and through a maze of mining tunnels kilometers in length. With the ability to pinpoint RFID using localized ultrasound, the hx19 does a good job of employee or personnel tracking for workplace management. 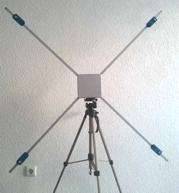 HX19 system is formed; using only the three basic building blocks shown above: the transmitter, the receiver and the synchronizer/monitor. Hx19 is a solution to a wide variety of positioning problems; ranging from "personnel workplace management", to industrial grade real time spatial feedback. Space coverage, and system size, is limited only by the number of the components purchased. It is easy to install, with a common USB driver FTDI available for most operating systems. The following application; depicts an operation using a few receivers, and a few transmitters, in 3 dimensional space. Data is shown as streaming from the receivers, to an hx19ms-usb, which makes the data available, on the laptop below. Hx19access program; is used for this particular setup, and the hx19xyzDDE used above, can also be used. If the log option is checked, then the streaming data will go to a text file called hx19.log. The source code for this program is included with the hx19. The hx19 comes with a software bundle written in visual basic 6, for simplicity. We decided to present a REBOL open source code as well to open doors to additional operating systems. The above shows two small operations, slightly different in nature. But the application below, is different from the ones above. Unlike above, the xyz position may not be required for the subject, the location of the containing room, is sufficient in this case. The hx19 can serve well as an attendance system. Below: the application monitors the locus, of objects and people in their habitat, hence the term "HabiTag". Tools are available in Java/Groovy and leverage ZeroMQ to allow local or network access to devices from a number of programming languages and platforms.